A beach outfit breaks down to just a few basics: swimsuit, flip-flops, bag, and hat. It’s a classic formula that’s been serving beachgoers well for decades. But just because it’s a formula doesn’t mean it has to be plain—experimenting with your accessories can breathe new life into any look. Even something as simple as picking out the perfect hat or visor. Yes, visors are in! These half-hats are making a comeback thanks to the 80s and 90s inspired trends currently in fashion. They offer the same face protection as hats, while giving a unique trendy vibe to your beach look. This chic visor is minimalist and elegant. It’s comfortable, durable, and made of straw that protects from UV rays. Available in a variety of colours, it comes with a removable terrycloth band that is great for soaking up any sweat. 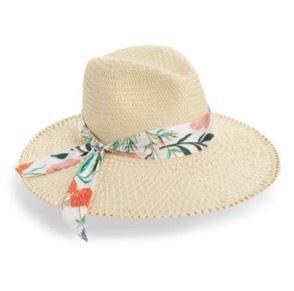 This wide-brimmed floppy straw hat offers plenty of protection from the sun. 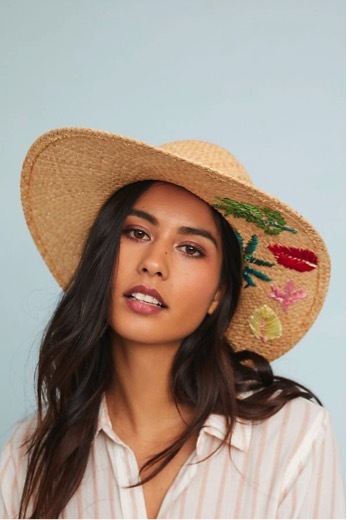 The colourful embroidered leaves on the brim add a fresh vibe to this summery classic. With its brightly coloured transparent vinyl, this visor fully embraces the retro trend. It’s fun and flirty, and the perfect bold accessory to help you stand out wherever you wear it. Nothing says summer like this lovely fedora. Made from light, cream-coloured straw, it offers excellent head protection, while the nature-print sash adds a splash of colour. It’s a classy, elegant choice. We’re loving the look of this unique boater. The brown straw, the ribbon, and the band of dangling colourful shells all combine to create a sleek eye-catching hat.